The Alice09 Yahoo group has 20 new photos from the centennial re-enactment of Alice Ramsey’s pioneering drive across the U.S. Visit groups.yahoo.com to sign up. There were at least two such trips this summer; this one found Dorothy Grace and Dana McNair driving much of the Lincoln Highway in commemoration of Alice Ramsey’s 1909 trip, Dorothy in a 1915 Model T and Dana driving a 1909 Cadillac. Dorothy just posted the photos in the “July 3-6” album, such as these below: Ruth, Nevada, and the California state line. Learn more at aliceramsey-theroadtrip.blogspot.com/ where you can also read all about their daily adventures on the road. You can follow along with the two teams of women who are retracing the path of pioneer motorist Alice Ramsey. Both are mostly taking the Lincoln Highway across the Midwest. Greetings from Ogllala, NE! We made it here yesterday at around 4pm. Unfortunately, our 200 mile day in the Maxwell (Babbs) was cut short because the dreaded noise returned. The day started out so well — the Maxwell, the Spyker and the Rambler were rolling down the road at 8am. Our first rolling stop was over the original Lincoln Highway bricks in Shelton, NE that we learned about in South Bend, IN. We were excited to see Bob and Lennie [Stubblefield] again (3rd time! South Bend, IN Grand Island, NE & Shelton, NE). This time Lennie ran out to the car to hand us some SUPER cold water! Thank you both for all of your hospitality and energy! It really keeps us going! We started out (after tent camping in the thunderstorms) at the AAA office for some more maps. When Dana & I returned to the parking lot, a woman said, “I’ve aged well – I’m Alice Ramsey.” Alice White Ramsey was at AAA because she & her husband are heading to Alaska shortly. She had seen a newspaper article about the trip. When I looked toward the Model T – there were blue T shirts everywhere – Central Elementary kids had swarmed Dan, and were excited to honk the horn. Candi, one adult with them, had said they recently went to the Hastings Museum and were curious about the cars there. The kids moved on to the Cadillac horn, then the dogs. The women’s club building and the canal were cool in Kearney. In Lexington NE, we visited with Rick from the Early Cadillac Website – from Dana’s posts re: a hubcap for the 1909 — the saran wrap/ziplock is still working. He inherited a 1906 Cadillac project when his stepfather died. He also has few of his own cars in his building. Things were going well in North Platte, so we headed on to Ogallala. We are in the next time zone now. Mosquitos were bad — right next to South Platte River, but a swimming pool at the hotel. The 2009 Lincoln Highway conference was a lot of fun — so much so that I couldn’t keep up with this blog! Tuesday evening found us at dinner with special guest Emily Anderson, who along with copilot Christie Catania is retracing Alice Ramsey’s pioneering 1909 trip. That’s them below along with dad Richard Anderson, who built the car from parts. But that’s not the only Alice Ramsey trip re-creation! Dana McNair alerted me that she and Dorothy Grace are also driving much of the Lincoln Highway in commemoration of Alice Ramsey’s 1909 trip. Dorothy is driving a 1913 Model T and Dana is driving a 1909 Cadillac. We stopped for the best chocolate cake in the world at Niland’s Cafe in Colo, Iowa, and got to put our cars in the gas station for photos. We stood at the confluence of the Jefferson and Lincoln highways. How cool is that! Friday morning found them eating breakfast in Missouri Valley, Iowa, when they saw Emily drive by! You can follow their journey at aliceramsey-theroadtrip.blogspot.com/. We are so enjoying this trip. We are definitely driving without fanfare. We are just having fun, stopping to visit folks who have been kind enough to offer us lodging or a visit. Camping or fixing cars along the way, sometimes under trees by the side of the road, sometimes in truck stops, it all depends on the autos and whether they are having a good day or not. We have met some great folks, and as it is so low key it is very intimate. We have a lot of new friends in cafes and truck stops. Sometimes is does get a little discouraging to be confused with the Emily Anderson trip and we do hate to disappoint people but what we are doing does count in it’s own way and the purpose has always been just to drive the drive and have fun together. So, I can’t tell you how much I appreciate your writing back to us, truly it makes us feel good about our trip that at least someone is keeping track of us besides our mothers. The team got underway at approximately 9:00 am in front of 1930 Broadway (67th Street across from Lincoln Center and about 1-1/4 mile north of the Eastern Terminus in Times Square). Unfortunately a thunderstorm had just passed through and it was still raining. I did get to talk to Emily Anderson, the driver, and Christie Catanie, the navigator, and they are of course excited about their trip. They are looking forward to being at the LHA annual conference in South Bend next week. Even the gloomy day and the thought of driving an open car (the canvas top was put up but there are no side windows so the vehicle is essentially open), and the reporters and cameras in their faces did not seem to dampen their spirits. The first photo shows Emily at the wheel (note the right hand drive) and Christie in the passenger seat as the car was pulling away from the curb. The second shows Emily being interviewed with her mother in the foreground (holding flowers). The 1909 Maxwell is magnificently restored. When they stepped to the front to hand crank it to get it started and the engine sputtered to life, it was amazing even though it ran with so much valve clatter it sounded like some of the diesel trucks going by it on Broadway! Below is a photo from their trip eastward to NYC. LHA president Bob Dieterich snapped Kathy Franzwa in the restored Maxwell in front of her house in Tooele, Utah. Her late husband Gregory Franzwa ublished the book Alice’s Drive, which reprints her tale of the trip plus he added his modern-day sleuthing of her route. Alice Ramsey’s story was once well-known: on June 9, 1909, she and three female companions set off from NYC in a new, dark green Maxwell DA. She reached the Pacific 59 days later, becoming the first woman to drive coast-to-coast. $19.95 plus $4.95 s/h direct from Franzwa’s Patrice Press. The centennial recreation of Alice Ramsey’s pioneering trip across the U.S. has already garnered coverage in the LA Times, NY Times, and PR Web. In 1909, Ramsey became the first woman to drive across the U.S., accompanied by three female companions and publicity people from her carmaker, Maxwell. Much of the trip followed what would become the Lincoln Highway four years later. Emily Anderson (right) is recreating the cross-country trip in a 1909 Maxwell over the same route. Emily and her group leave New York City on Tuesday, June 9, for a five week journey to San Francisco. They launch from 1930 Broadway, near Lincoln Center, at 9 am. For those who wish to visit, they will bring the car over the Queensboro Bridge around 6:30 am and be on Broadway by 7:30. They will stop in Tarrytown, New York, for a quick photo op at the old Maxwell Briscoe Motor Co. plant where Maxwells were built for many years. Emily will be joined by friend and navigator Christie Catanie of Colorado. Also traveling in separate vehicles will be her dad Richard Anderson, who built the Maxwell from pieces, and his wife Margaret. Also along will be chief mechanic Tim Simonswa and his wife Barb. You can track the journey at www.aliceramsey.org and click on the map marked “Follow Along.” They hope to visit the LHA conference in South Bend, Indiana, on June 16. 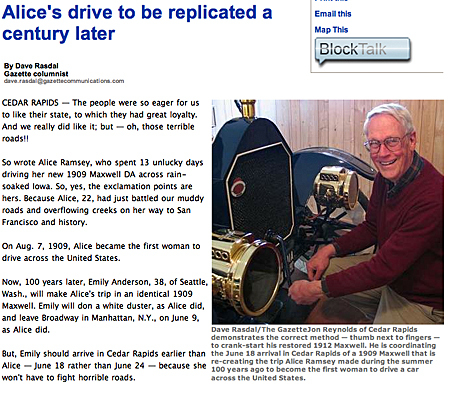 Summer 2009 will be the centennial of the first woman to drive across America, Alice Ramsey. In honor of that groundbreaking event, Emily Anderson and a co-pilot will leave New York City on June 9, 2009, for San Francisco. They’ll follow the same route over 41 days in the same type car as Alice used (a 1909 Maxwell, restored by Emily’s dad), with celebrations along the way. Here’s a 4-minute trailer about the next Alice’s Drive.